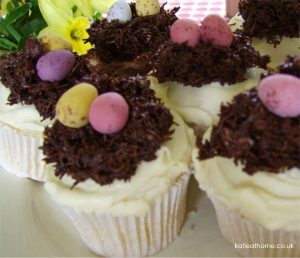 Easter cakes with a difference. I am always trying to think of different cakes to do for Easter and I am sure you are to. I dont know what happens in your house but here, if I ask the question what kind of cakes shall we make, the answer always seems to involve chocolate! 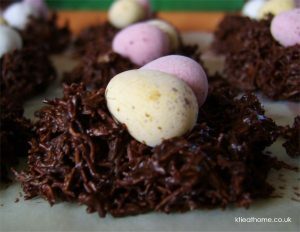 So this year I decided to make Easter Nests with a difference and here it is my recipe for Easter Nest Cup Cakes. Soften the butter by mixing it in bowl gently add the icing sugar and mix, add the vanilla essence, depending on the consistency of your icing (it should be thick but easy to apply to cakes) add a few drops of water if it is too thick and wont apply smoothly. When icing your cup cakes make sure you place a thick layer on top of each. You can also add a tsp of cocoa powder to make some chocolate butter icing, I make some of each. 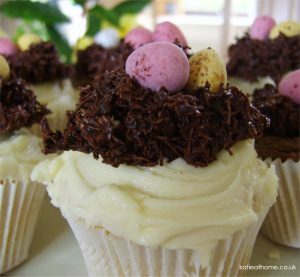 Once you have put icing on each of your cup cakes you can then add a nest to the top of each, and there you are your very own Easter Nest Cup Cakes. 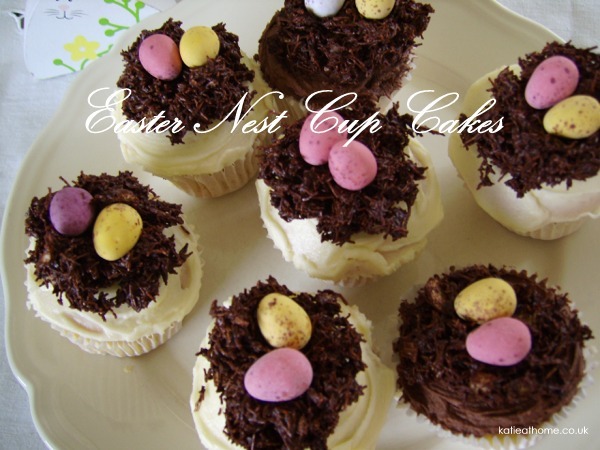 So for Easter I have shown you some simple Easter presents to make and Easter Nest Cup Cakes. Have fun. If you wrapped a few of these cakes they would also make a great gift.